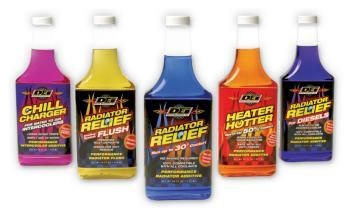 DEI Cooling Additives UNIVERSAL - Dezod Motorsports Inc - Home of the automotive performance enthusiast since 2002. These performance coolant additives are specially formulated to reduce the surface tension of the coolant which maximizes the thermal conductivity and transfer process through the cooling system. Coolant additives include a corrosion inhibitor that balances the negative acidic effects that can develop over time in antifreeze and water solutions. It also stabilizes the pH level which helps reduce rust and prevents electrolysis, mineral deposits and pre-existing scale build-up from forming resulting in potential core damage for long term protection. An anti-foaming agent is part of the formulation in each of these products that promotes superior coolant contact in the cylinder head to accelerate the heat transfer process. Radiator Relief supercharges your radiator by transferring heat more efficiently through the radiator. This proven coolant additive will reduce your operating temperature up to 30°F reducing engine wear that occurs during extreme use. Radiator Relief is also formulated with a corrosion inhibitor that reduces mineral deposits. This is the first additive that maintains pH levels that otherwise fluctuate over time resulting in core damage. Radiator Relief for Diesels supercharges your radiator by transferring heat more efficiently through the radiator. This proven coolant additive will reduce your operating temperature up to 30°F degrees and reduce engine wear that occurs during extreme heat. Radiator Relief for Diesels is also formulated with a corrosion inhibitor that reduces mineral deposits. This is the first additive that maintains pH levels that otherwise fluctuate over time resulting in core damage. Radiator Relief Cooling System Flush is a concentrated cleansing agent that effectively removes rust and mineral deposits left behind in the radiator core and hose lines. This advanced treatment also dissolves oily residue build-up left behind in old anti-freeze and coolant mixtures due to external contaminants. Helps maintain optimum efficiency and recommended to be used with distilled water. Chill Charger for water-to-air intercoolers maximizes thermal transfer to lower air intake temperatures while also protecting core corrosion, electrolysis and harmful mineral build up. By effectively trasferring water that circulates through the intercooler Chill Charger™ reduces liquid heat soak in high performance turbo and supercharger systems. Heater Hotter formulated specifically to accelerate the transfer of heat from engine to cooling system in frigid climates that otherwise increase engine wear. Heater Hotter’s™ unique formula allows your vehicle’s heater to warm up 50% faster in even sub-zero temperatures and is safe to mix with all types of anti-freeze. Just simply add to your radiator.